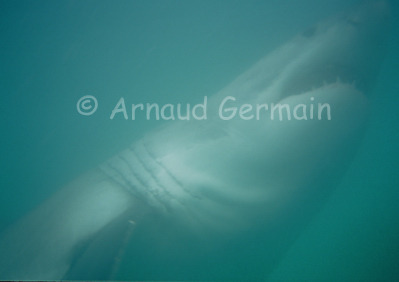 I took this picture using my Motormarine II without a flash off the coast of Gaansbai, South Africa. I was in a cage at the time but would like to see a great white without being resticted to the confines of a cage. What I saw during the two days I spent in the company of these wonderful predators is that they behave like any other sharks: they are careful, cautious, even timid when approaching the bait. I was very disappointed by the commercial aspect of cage diving. It felt like one of these tourist traps. Luckily, the great whites came to see us up close.